Time to twirl. 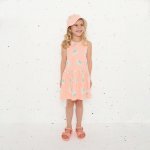 This sleeveless kids dress is ready to have fun in the summer sun! The "Bowie Bunny" vintage print is fresh and summery, whilst the curved waist hem detail keeps the dress loose and comfortable in the heat. Dressing is easy with the press stud opening at the back neck.